Israel today offered to give material and technological support to India in fighting terrorism, while expressing concern over a growing fanatical Islamic terrorism in the world and the threat of nuclear weapons falling in the hands of fundamentalist forces. At least 10 persons, including three policemen, were injured tonight when communal clashes marred Ganesh idols immersion in Vadodara city and Balasinore town of Gujarat, police sources said here. 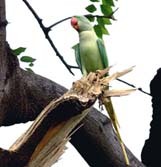 A parrot sits on the top of a tree to welcome the autumn in New Delhi on Tuesday. Taking serious view of the increase in custodial deaths all over the country and the violation of human rights by the police during investigation, the Supreme Court has ordered the payment of Rs 1 lakh as compensation to the mother and minor children of a victim of police torture. The Ganesh festival came to an end today after 10 tension-filled days in the aftermath of the last fortnight’s twin car bombings in the city. Devotees splash water on a large clay statue of Ganesh during its immersion into the Arabian Sea in Mumbai on Tuesday. A delegation led by the President of the All-India Riot Victim Relief Committee, today sought the intervention of the National Human Rights Commission in moving the Supreme Court for retrial of the 1984 riot cases. As Congress MLA Pramod Tiwari voiced support to the confidence motion brought in the state Vidhan Sabha by Uttar Pradesh Chief Minister Mulayam Singh Yadav yesterday, a sense of despondency gripped Congress MLAs about their future in the coalition. Three victims of the alleged atrocities of Uttar Pradesh’s controversial MLA Raghuraj Pratap Singh, alias Raja Bhaiya, today moved the Supreme Court challenging the Mulayam Singh government’s decision to withdraw the cases under the Prevention of Terrorism Act (POTA) against him, his father and a relative. The Bharatiya Janata Party (BJP) today asked the four Congress-ruled states to furnish details of the ‘use or misuse’ of thousands of crores worth free Central foodgrains given for drought-relief last year. The Congress has decided to “withdraw” its planned hour-long countrywide ‘rail roko’ agitation on September 22 in protest against the “failures” of the BJP-led government at the Centre. In an obvious message of cultural nationalism ahead of Assembly poll in four North Indian states, a BJP-centric Delhi Study Group is felicitating kin of 1965 war hero Abdul Hamid at a function here on anti-terrorism day on September 11. Second Indo-Bangladesh bus service likely by month-end. Kerala celebrates tourism week along with Onam. A physically challenged man from Uttar Pradesh braves the struggle of life. Television in India widens reach, targets a bigger audience. “We can train and teach and supply materials we have developed in fighting terrorism. We have developed a very advanced technology....,” Israeli Deputy Prime Minister Yosef Lapid told reporters after a meeting with Chairman of the All-India Anti-Terrorist Front (AIATF) M.S. Bitta at the latter’s house here. Observing that India and Israel had mutual problems, like terrorism, he said the two friendly countries could aid each other. Both the countries faced attacks from outside and also “fanatic” Muslims who wanted to destroy civilisation, he said, sharing the sufferings of the people in Kashmir and the terrorist attack on Parliament. “In Israel we have a great deal of experience (in fighting terrorism). So have you,” he said, adding that a great deal of suffering had been caused by terrorism which had become an important issue of the 21st century. He cautioned that if terrorism was not fought tooth and nail, it would wipe out civilisation one day. Mr Lapid said after the USA had learnt a “very bitter lesson”, it was time for Europe to be cautious. If they did not fight terrorism, they might fall a prey to the menace in another five years, he felt. Warning that Iran should not possess nuclear weapons, he said the international community should make efforts in preventing Tehran from acquiring nuclear power. Supporting the idea of opening a training institute in India jointly with Israel for combating terrorism, Mr Lapid said it was required to study the menace in a scientific way. It should be taught in schools and there should also be a college to impart training in fighting the menace, he added. The violence in Vadodara erupted when acid bulbs were hurled at a Ganesh immersion procession, triggering clashes between two groups throwing stones at each other in two incidents at Panitgate and Yakoubpura localities, leaving three policemen and two civilians injured, they said. The sources said at least three policemen were injured at Panitgate when one group hurled acid bulbs at the procession and police party. The police fired in the air to disperse the mob, they said. Power supply in Yakoubpura area went off, triggering stone pelting among groups even as officials said this might have provoked some mischief mongers. Director-General of Police K. Chakravarthi dismissed reports which said over 30 persons were injured in Vadodara violence. The police arrested two officials of cellular phone companies on the charge of defying the police orders banning sending of SMS on account of the sensitivity of the occasion. “Assault and death in custody, which have assumed alarming proportions, raise serious questions about the credibilty of the rule of the law and administration of criminal justice system,” a Bench comprising Mr Justice Doraiswamy Raju and Mr Justice Arijit Pasayat said while awarding compensation to the kin of the deceased, Abdul Gafar, who had died in Mumbai police custody. “The cry for justice becomes louder and warrants immediate remedial measures. This court has in a large number of criminal cases expressed concern at the atrocities perpetuated by the protectors of law,” it said. “Police excesses and the maltreatment of detainees or undertrial prisoners or suspects tarnishes the image of any civilised nation and encourages the men in ‘khaki’ to consider themselves to be above the law and sometimes even to become the law unto themselves,” the court said adding stern action was required to be taken to check the malady. The Maharashtra Government was also ordered to conduct fresh probe into the death of Gafar and fix responsibility of the police officials. The tenth day of the Ganesh festival saw millions of devotees crowding the streets leading to the sea, creeks and other water bodies to immerse huge idols of the elephant-headed god. The traditional chant of ‘Ganpati Bappa Morya, Pudchya Warshi Laukar ya’ resounded the city’s streets as millions of devotees bid farewall to Mumbai’s favourite diety. The concept of public worship of the elephant-headed god was first brought to Mumbai 155 years ago by freedom fighter Bal Gangadhar Tilak to mobilise public opinion against the colonial rule. The day began with several small organisers and individual households bringing their idols for immersion. 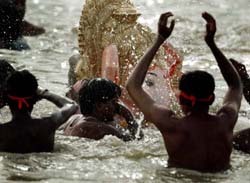 As the day progressed, a large number of bigger idols were brought to various beaches for immersion. “A number of big organisers heeded to our queries to bring in the bigger idols in the day itself,” a senior police official said. Earlier during the festival, police sources said the usual practice of bringing all jumbo idols at night were fraught with security problems. Some of the idols that were scheduled for immersion in the evening included the giant Ganesh idol of Lalbaugh in central Mumbai, called ‘Lalbaughcha Raja’. As per the tradition, this is one of the last idols from the city’s Marathi heartland to be immersed to mark the end of the 10-day festival. Security has been the tightest that the city has ever witnessed. Helicopters belonging to the Coast Guard were circling overhead to keep a watch on the proceedings. In a meeting with the NHRC CHairperson, Justice A.S. Anand, a delegation led by the President of the Relief Committee, Mr Kuldeep Singh Bhogal, suggested that these cases could be transferred to some other jurisdiction. In a two-page memorandum to the Commission. The committee has stated that former Union Minister H.K.L BHagat and other accused were acquitted despite evidence by family members of victims that Mr Bhagat had instigated the riots. “In spite of the said statement, the Judge acquitted Mr Bhagat on erroneous grounds of technical defects and wrong investigation and some minor contradictions to the utter surprise of all humanity,” the memorandum reads. “Why should we support Mulayam Singh Yadav if the high command does not want us to join the government?” asked Kanpur MLA Ajay Kapur after a meeting of Congress MLAs held late night. Highly-placed source told this correspondent today that section of Congress legislators had told Congress President Sonia Gandhi’s emissary Subodh Kant Sahay that the party might face another split in the state if the high command continued to procrastinate on participation. “Congress support is more of a compulsion for Mulayam Singh Yadav after the 37-member breakaway BSP group merge with the Samajwadi Party,” a Congress MLA said. “In this scenario, a split in the Congress becomes more imminent if the high command continues to dilly-dally its decision on Congress participation in the government”. With the merger of 37 BSP defectors yesterday, the count of his flock went up to 181 and six more BSP members were expected to join before the confidence vote. The Samajwadi Party would, thus, have 187 MLAs in the House of 403. With the Rashtriya Lok Dal (with 14 MLAs), Rashtriya Kranti Party (4), CPM (2), Loktantrik Congress (2), smaller parties (6) and 13 independents, it would command a support of 228 MLAs without the Congress. Sources said the Uttar Pradesh Congress Committee chief Jagdambika Pal had told party legislators that he had tried his best to press the high command in favour of joining the government. A three-Judge Bench comprising Chief Justice V.N. Khare, Mr Justice Brijesh Kumar and Mr Justice S.B. Sinha posted the hearing on the petition by Mr S.K. Shukla, Mr Kunwar Akhilendra Singh and Mr Pitamber Saroj, for September 12. The court, however, declined to grant an immediate stay on the possible release of the trio, when a reference about the filing of the petition was made in a special mention before the Bench by the petitioner’s counsel K.S. Bindra as it was not listed for hearing today. When their counsel persisted that the court should at least grant an interim stay on the UP Government’s August 29 order for withdrawing the cases against Raja Bhaiya, his father Udai Pratap Singh and kin Akshay Pratap Singh, alias Gopalji, the Bench said it would hear the matter on Friday and if a case was made out for stay, an order for status quo would be issued. Addressing newspersons, BJP spokesperson Mukhtar Abbas Naqvi said the Central assistance of grains for the poor in the states did not reach the needy. “It is necessary to explain to the people who benefitted by use or misuse of these grains and it is the responsibility of the state governments to give explanation to the people”, Mr Naqvi said. The foodgrains should have found their way into the dinner plates of the poor and not to the corrupt dalals. The state governments owed an explanation on the utilisation aspect of the grains, he said. He said the Rajasthan Government got 10.6 lakh tonnes of foodgrains worth Rs 4,427 crore to surmount the ill-effects of drought last year followed by 9.7 lakh tonnes worth Rs 4,303 crore by Madhya Pradesh. Chhattisgarh had received 3.08 lakh tonnes of foodgrains worth Rs 1,700 crore and Delhi received 2.71 lakh tonnes worth Rs 1,219 crore. Despite receiving the record quantum of foodgrains, it was evident that the grains had not reached the intended segments of the society in the four Congress-ruled states. Sources said party general secretary Oscar Fernandes had communicated to the PCC chiefs and CLP leaders that the ‘rail roko’ programme on September 22 and ‘rasta roko’ agitation on September 30 had been withdrawn. The sources said blockade programmes had been withdrawn in view of the feedback that the party had received over the inconvenience it would cause to the public. However, the party would organise the protest on September 30. The protest would mainly highlight the nine charges made by Congress President Sonia Gandhi during the no-confidence debate in Parliament. 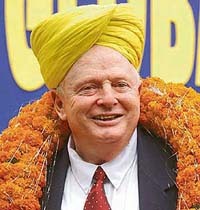 Deputy Prime Minister L.K. Advani will be the chief guest and one of the two well-known Muslim faces of the BJP- Union Textiles Minister Shahnawaz Hussain — will grace the function. According to sources, the group has requested the Centre to allot a petrol station to Hamid’s family.